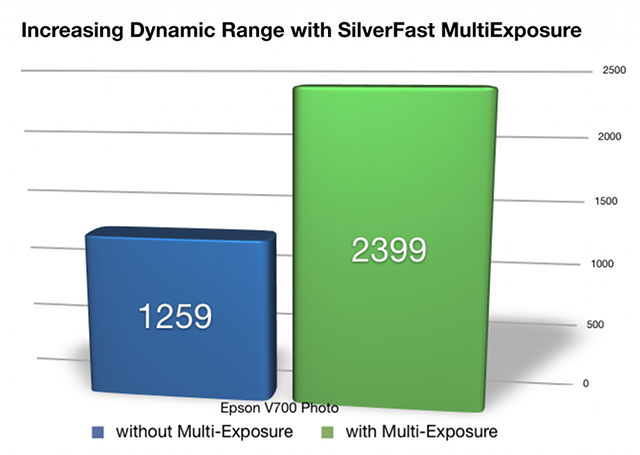 SilverFast taps the full potential of Epson's high-quality devices. Many flatbed scanners are not only proper for digitizing documents and photos, but are also suitable for scanning slides, negatives and filmstrips due to their transparency units. SilverFast is included in many Epson scanner's package of delivery to turn these scanners into professional devices, that deliver high quality scans. If you are going to purchase a new Epson scanner, we recommend to assure SilverFast is included with the device. This video explains the benefits of scanner software SilverFast 8 compared to the Epson Scan software in use with the latest Epson scanners. 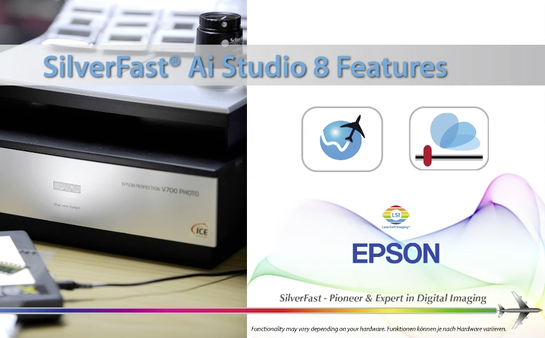 High-quality Epson devices with a special edition of SilverFast are part of the SilverFast Office series. This SilverFast Office products are highly specialized through customized SilverFast software. They meet the requirements of the German federal printer Bundesdruckerei for the creation of identity documents in DIGANT® process (Digital application process). For more information and purchase options, please visit www.officescanner.de (German). SilverFast X-Ray has been specifically designed for digitizing X-ray film. Thanks to individual customization the software is able to extract a maximum amount of details as well as the entire tonal range of medical and scientific X-ray film. More information can be found here: SilverFast X-Ray. Select your Epson model to obtain scanner-specific information. Download demos and updates, check compatibility and prices. For questions or problems regarding SilverFast and Epson scanners, please refer to the support overview page, which provides a variety of useful links, like our Epson forum, the general FAQ and the current system requirements. SilverFast's 64bit HDRi format contains all readable image information along with the data of the infrared channel. 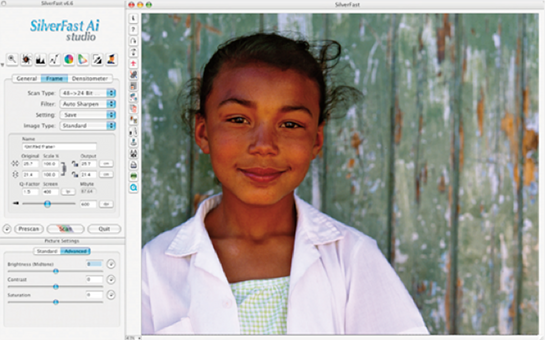 For a perfect HDRi workflow, we recommend the SilverFast Archive Suite for your Epson scanner. Kodachrome slides are particularly difficult to digitize, the scans often show a blue cast. Using a Epson scanner with SilverFast, you obtain perfect scans. Even SRD and iSRD can be applied. John Gittens, professional photographer - As a lifelong but now retired Professional Photographer I have scanned many images though most in recent years. In 2003 we purchased an Epson 2450 scanner. Included with that scanner was the SilverFast program. At that time I had never heard of it, had just used the software that came with previous scanners. We recently purchased a new Epson scanner, the Perfection 850 Pro as our previous one wore out. To say the least I was very surprised at the options offered with SilverFast and naturally used that for all my scanning. Since that time, they have constantly upgraded options in their software, naturally each time improving it. There are options for scanning virtually anything you might want to scan, transparencies, colour negatives, black & white negatives, prints and documents. There is even a separate option for Kodachromes. There is also the option for scanning in newspaper or magazine cuttings - Descreening, if there is a picture in there that you want to make a copy of for yourself. However as well at the options for Automatic Image Optimization for many different types of images, one can also use ones own judgement for changing settings such as colour, contrast, density, as well as being to change overall colour, one is able to change individual colours of an image without changing all. You can choose what ‘bit’ size you want your image as well as the finished scan size. One can set up a number of frame sizes for different size negatives or transparencies and save them for future use. If your scan item is not as sharp as it should be there is Unsharp Masking, another for Dust and Scratch removal. If you put your image in the scanner the wrong way, inverted, upside down, whatever, do not worry, with a couple of clicks that can be corrected. I must say it amazes’ me the improvements they keep making. As stated I am now retired but most days you will find me at the computer using SilverFast to scan in the many thousands of images in our files that we want to save AND improve in a great many cases. Just one example, in the 1950’s I used a roll of Gaevert transparency 35mm film to test it. Glad to say I did not buy any more, as many years ‘down the road’ I looked at a couple of those that I kept, and they were completely Magenta. I assumed they were ‘dead’ but did not throw them away. One day while scanning I happened to come across one of them, so decided to see what I could do with SilverFast. I must tell you that I was amazed at the result. It was not that the quality was as good as from a good colour transparency but it did give me a useable image! At this time I am scanning in some old black & white Newspaper cuttings that we do not have prints or negatives of, for a book. Again, they are not as good as from a good negative or print but they are useable, thanks to SilverFast. Thanks to our special Kodachrome profiles for our Epson software you have three major advantages compared to usual software that let you finally scan your Kodachrome slides in high quality: maximum Dynamic Range, IT8 calibration and free of dust and scratches. 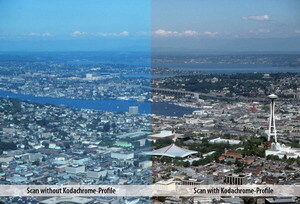 If you scan Kodachromes without IT8 calibration, the scans will consistently show a strong blue cast. Using SilverFast, the user simply goes to the general panel in SilverFast's main control dialog selects "Kodachrome" from the Pos./Neg. pop-up menu. 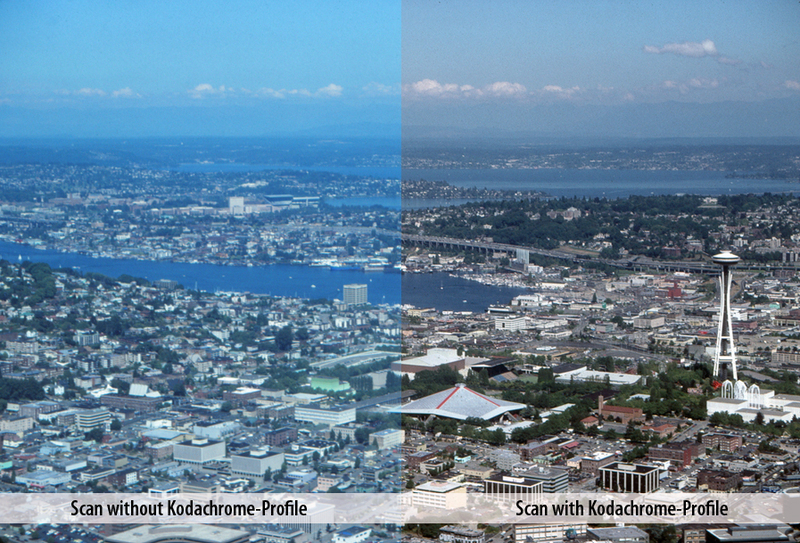 SilverFast now applies a Kodachrome profile, which is specifically adjusted for your Epson scanner. The blue cast is removed from the image! Dynamic Range is the most important factor for high quality scans, and a higher Dynamic Range ensures significantly better scans. Better scans means more visible details in highlights and shadows as a result of higher Dynamic Range. SilverFast Multi-Exposure® increases the Dynamic Range of the Epson V700 from 3.10D (without ME) to 3.38D (with ME). This increase shows that the scanner can see more levels of gray, an increase from 1.259 levels to 2.399 levels of gray (based on ISO Standard 21550*). That is a remarkable difference! Kodachromes scans can present an unsurmountable challenge due to the exceptional high density of the unique film material. Kodachromes can have a density of 3.8D - which equates to 6300 levels of gray or a contrast ratio of 1:6300! Due to our patented SilverFast Multi-Exposure technology our software helps Epson scanners to acquire the huge Dynamic Range almost completely. This ensures that no shadow details become lost in Kodachromes.